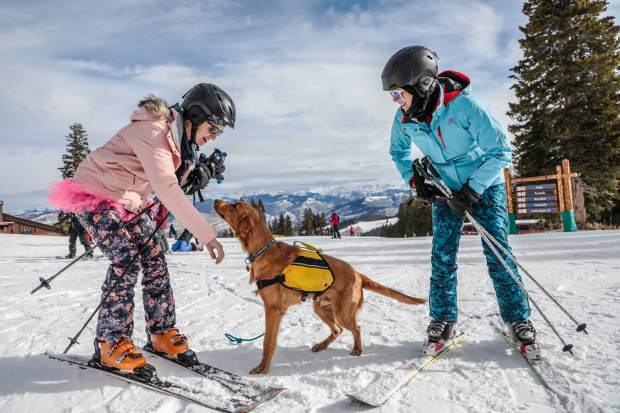 Whitney McLeod, left, and Alex Gold pet Willie, Beaver Creek's Mountain Safety canine ambassador during opening day Saturday, Nov. 17, in Beaver Creek. Beaver Creek skiers who enjoy a Thanksgiving weekend tradition at the resort had a chance to get their ski legs under them a week earlier than usual this year, and many took advantage. Beaver Creek opened Saturday, Nov. 17, with 261 acres of terrain, and top to bottom riding from both Cinch Express and the Red Buffalo Express. Sean Ebert, who works in Colorado and Texas, got the call from his wife about the early opening, which was four days before Beaver Creek’s scheduled opening of Nov. 21. “I was in Denver this weekend, she said you should go,” Ebert said. The longtime snowboarder was out on Beaver Creek for the Saturday Opening Day, earlier than usual, and earlier than his family. “Awesome to be out here,” Ebert said. Larry Briski and his sons visit Beaver Creek for Thanksgiving weekend most years. This year, they were there the weekend before for the early opening. “It’s a nice little bonus,” Briski said. Nick Briski, 10, and Sam, 8, will be back in school at Pine Ridge Elementary in Aurora on Monday and Tuesday before heading right back to Beaver Creek for their Thanksgiving vacation, which starts Wednesday. Snowboarder Mishko Beckwith, 8, heads back to Brush Creek Elementary in Eagle on Monday after riding Beaver Creek on opening weekend. His mother Martina said they were excited to be at their local resort for Opening Day 2018, but was also second guessing whether or not they should have went to Vail. “It sounds pretty nice there with the new openings,” she said. On Thursday, Nov. 15, Vail announced it would open more terrain on the east side of the mountain in the areas serviced by Chairs 11 and 14. By noon, Vail also had Chair 7 running with a large section of Game Creek bowl available for skiing, including the runs Showboat, Baccarat, Dealer’s Choice and Lost Boy. While the traditional Opening Day cookie competition won’t take place until its previously scheduled date of Nov. 21, Beaver Creek had cookies available nonetheless on Saturday. The Nov. 21 competition will begin at 2 p.m. where 5,000 cookies are available for sampling. Guests will double as judges, and $1,000 and bragging rights will be up for grabs as the Official Chocolate Chip Cookie Recipe of Beaver Creek for the 2018-19 winter season. On Friday, Nov. 23, Beaver Creek’s 38th Annual Tree Lighting Ceremony ushers in the beginning of the holiday season at Beaver Creek. Set in the heart of Beaver Creek Village, guests can enjoy a wide range of entertainment, culminating in the lighting of the tree and fireworks. Following the Thanksgiving holiday, Beaver Creek has much more on tap, including the Winter’s Extraordinary Start festival, complete with World Cup ski racing on Beaver Creek’s Birds of Prey course Nov. 29 to Dec. 2. Downhill training begins Nov. 27.